Every Dog Has Its Day…and Year! Are you a Dog (Person)? As you can see the Chinese calendar broadly matches with the Western calendar. As such knowing your birth year is usually all the information you need to find out your zodiac sign, unless you have a January or February birthday. If you’re living in China or any area with a significant Chinese community it’s a good idea to find out your zodiac animal. A common question in China is: “Nǐ shǔ shénme?你属什么” or “What is your zodiac sign?” This is not simply for fun, as people with certain zodiac signs are believed to get along better with certain other zodiac signs, be it in love, friendship or business. In the case of dogs, it’s believed they are most compatible with tigers, horses, or other dogs. Dragons, however, should be avoided. Similar to their animal counterparts, people born in the Year of the Dog are thought to be highly loyal. They are also considered honest and just, and make reliable friends and partners. Unsurprisingly, this makes dogs popular with others, although dogs can sometimes be overly anxious and worry too much. In addition to the 12 year zodiac cycle, there is also an overlapping cycle of the five traditional elements of Chinese cosmology: wood, fire, earth, metal and water, yielding an additional 60 year cycle. According to traditional Chinese belief, these also instill additional qualities. Earth dogs, (2018, 1958) for instance, are considered extremely persistent (sometimes to the point of stubbornness), whereas fire dogs (1946,2006) are thought to be dreamers. Don’t get too excited, however, if you are indeed a dog. In fact, years with the same animal sign as the one you were born in are considered unlucky for you, and most fortune tellers would advise against embarking on a new career or taking big risks. Some high profile people born in the Year of the Dog include US presidents Donald Trump, George Bush and Bill Clinton, plus British royals Prince William and Kate Middleton. Joining them are singers Justin Bieber, Elvis Presley, Michael Jackson, and Madonna, plus director Steven Spielberg. Some historic “dogs” include Winston Churchill (extremely fitting, no? ), Benjamin Franklin and philosopher Confucius. Interested in learning more about the Chinese zodiac? Check out our article about the origin story of this famous calendar. 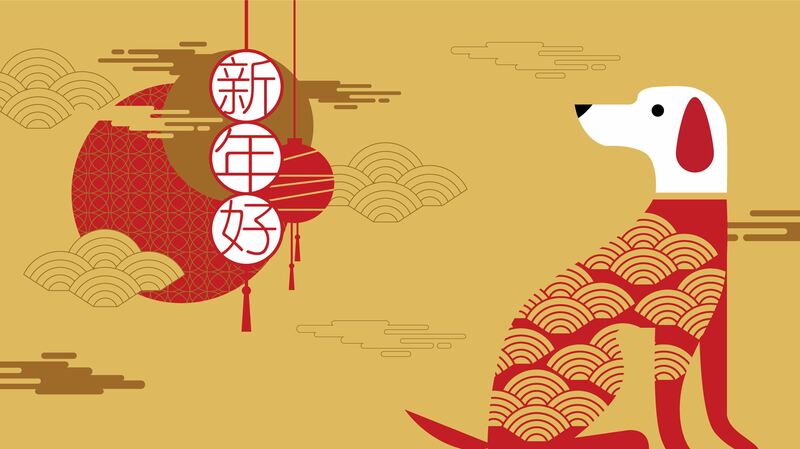 And if you want to read more about the outgoing year of the Fire Rooster check out our article from this time last year! Do you love Chinese language and culture? Why not make your ambition for the new year to master both through our immerse programs in China! Apply today!